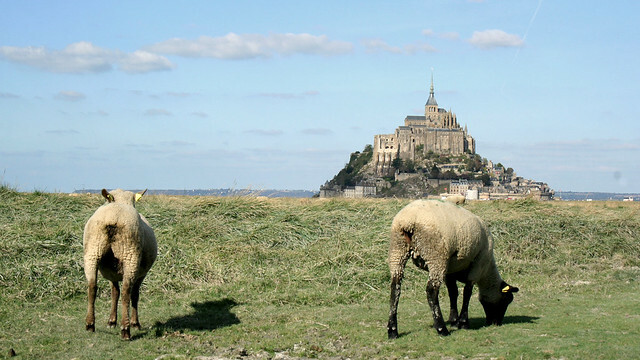 I am bemused each time I read an article exclaiming that Mont St Michel is a short day trip away from Paris, and this includes Rick Steves’ claim of it being an easy day trip. Maybe, if you are a staunch believer of around-every-country-in-Europe-in-30-days kind of tourism…? Let’s established a couple of basic things here. Given 24 hours in a day, and assuming one gets a good 8-hours sleep, we’re left with 16 hours for all activities in a day. If you need an hour or so to get ready in the morning – shower, personal grooming, breakfast (and coffee!) – now we’re down to 15 hours available for the day to play tourist etc. The Mont St Michel is a beautiful site and I highly recommend it to anyone who’s pondering whether to go or not. Situated at the boundary between Normandy and Brittany, it was assigned Unesco World Heritage Site all the way back in 1979 (before I was even born!) and attracts reasonable number of visitors each year. It is also, however, some 360km away from Paris. Not exactly the next town over. The journey between Paris and Mont St Michel on a car takes about 4 hours. For a day trip, well, double the time, so it’s 8 hours on the road, providing all goes well. Note that we haven’t even touch upon the time to spend visiting the actual place and its surrounding bay, never mind meals and what’s not. Still think this is a short or easy day trip? Short should never even be an adjective used in the first place to describe a day trip when you spend more than half your available hours on the road! If you are a relatively well-off visitor (read: not a RTW-er/student on a tight budget) it can be fairly easy. Just book in with a private tour group and they’ll organise it all. They may even pick you up at the hotel. For this, your “short” day trip takes approximately 14 hours, of which more than half the time would be spent staring at the greens lining the autoroute. Among the 5-6 remaining hours, 1-2 would be set aside for meals, so do the maths on how much time you actually get to see the island town and former monastery. A car rental could be a cheaper alternative, providing there are a few people sharing the costs and driving duty. There is also a certain extra degree of freedom associated to a self-drive trip, but be careful about going over the speed limit. Just because one doesn’t live in France doesn’t mean a summon will not arrive in due course from the authority if caught speeding. For anyone brave enough to want to attempt a visit by using public transportation, serious time coordination is required. There are a couple of sensible options: (1) take the direct train from Paris to Rennes (about 2 hours 10 minutes), then continue on the 90-minutes Keolis coach ride, or (2) take the indirect train from Paris to Pontorson which is about 10km from Mont St Michel (about 3.5-4.5 hours, depending on connection time), followed by a coach/taxi. You don’t need me to point out that whichever way you do it, the travel time is still going to be long for a day trip. Make it a 2-day or a weekend trip – you’ll be far happier. I visited Mont St Michel as part of a Normandy/Brittany roadtrip a few years ago and I was (still am!) very happy to have taken it in at a reasonable pace. We stayed at a lovely gîte not far from Mont St Michel (with the owners providing us lips-smacking homemade jam for breakfast), drove there in the morning and had plenty of time to visit the abbey as well as the enclosed town. We even took a walk around the bay, although not in competition with the infamous tide given our timing was off by a good few hours. Hey, we can only plan the trip the best we could, while Mother Nature has its own rhythm to maintain. Someone should redefine what a day-trip is in the context of quality travel. A day-trip shouldn’t be a visit to a place that you manage to travel to/fro within a day and squeeze a couple of hours in to see. If that’s the case, even New York, Stockholm or Turkey could be a day trip from Paris, but who would do that?! Ideally, a day trip should not be more than a couple of hours away by the public transport, and of which your visit-to-travel-time ratio should be at worse 1:1. If you are spending less visiting time than the travel time, I would urge a serious rethinking. I am saying this because I’ve fell into the trap of mis-planning day-trips myself. Each time I did not get at least a 2:1, never mind 1:1, visit-to-travel ratio, I was mentally kicking myself for not thinking about staying overnight. Strangely, it’s never a case of getting up earlier or sleeping less so I can add another hour or two to the trip. The purpose of a trip is to enjoy it, not to get myself to the point of exhaustion. It is fairly irresponsible, in my opinion, that tour groups and guides are encouraging long frazzling excursions through the disguise of “easy” and “short” day-trips. I understand that there are people who are short on time, trying to do as much as possible, and willing to take on the punishing schedule. These people also know what they are getting themselves into. However, for businesses to tout something to be more trivial that it actually is, that is disingenuous at best, and dishonest operational practice otherwise, to the other visitors who truly believe that it is that simple after reading promotional materials/articles that they trust. Mostly I needed to rant about people saying it’s a good spot for day-trip when it is clearly not. Do you have any recommend tour web site for it? Unfortunately I do not. Many tour website that I’ve came across tried to run the trip in a single day, which I’m not a fan of and therefore could not endorse.